NEW YORK (Aug. 3, 2018) — The Brain & Behavior Research Foundation has announced the winners of its 2018 Klerman and Freedman Prizes recognizing exceptional clinical and basic research. The prizes honor the work of outstanding researchers who have been supported by the Foundation's Young Investigator Grant Program. The grant program enables scientists who are early in their careers pursue innovative ideas in neurobiological and psychosocial research, gather pilot data and generate "proof of concept" for the early detection, treatment, prevention and cures for mental illness. The awards were presented by Dr. Herbert Pardes, President of the Foundation's Scientific Council, at a ceremony in New York City on July 27. 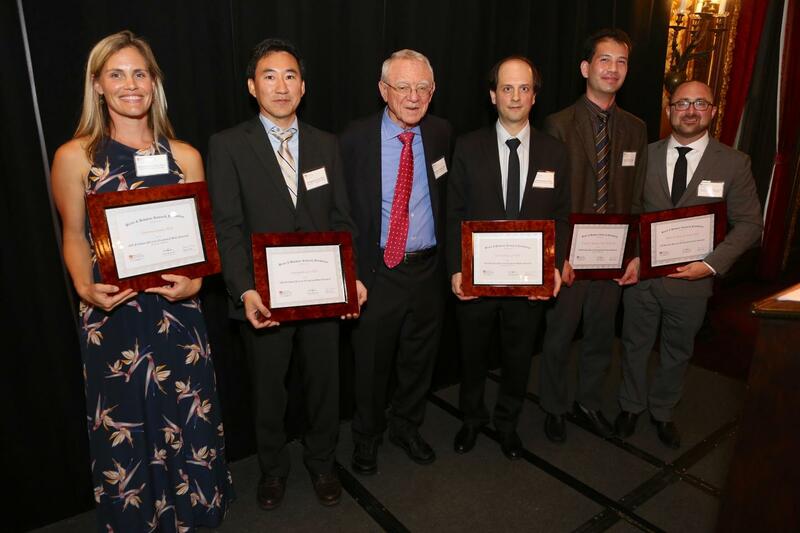 The Klerman & Freedman Prizes are awarded annually on the evening before the Foundation's annual Scientific Council meeting. The group of 172 leading experts across disciplines in brain and behaviors research meets to discuss grant applications and recommend the most promising ideas to fund. Dr. Jeffrey Borenstein, President and CEO of the Brain & Behavior Research Foundation, said, "Since 1987, we have awarded more than $394 million to more than 4,700 scientists in more that 35 countries around the world, and we have seen great strides that have changed the lives of people living with mental illness. However, much remains to be learned, and through continued support for creative research and innovative approaches we envision a future in which we will fully unlock the mysteries of psychiatric disease." 2018 Klerman Prizewinner for Exceptional Clinical Research: Albert R. Powers III, M.D., Ph.D., Assistant Professor, Medical Director, PRIME Psychosis Prodrome Research Clinic, Department of Psychiatry, Yale University School of Medicine, The Connecticut Mental Health Center In addition to treating patients who suffer from the earliest symptoms of psychosis, he uses computational approaches to understand how sensory systems might go awry to produce hallucinations and other psychotic symptoms. Dr. Lim's research investigates the neural circuitry behind stress-induced depression and autism spectrum disorder (ASD). Dr. Mariano studies a type of noninvasive brain stimulation called transcranial direct current stimulation (tDCS) as a potential treatment for the emotional symptoms of chronic low back pain. Dr. Gremel's lab examines the neural bases of goal-directed behavior. Dr. Rutishauser's laboratory investigates the neural mechanisms of learning, memory, and decision making. The Klerman and Freedman Prizes, awarded annually, are named for Gerald Klerman, M.D., and Daniel Freeman, M.D., neuropsychiatry pioneers who played seminal roles as researchers, teachers, physicians and administrators. The prizewinners are selected by the Brain & Behavior Research Foundation's Scientific Council. Dr. Herbert Pardes, President of the Scientific Council, Executive Vice Chairman of the Board of Trustees, NewYork-Presbyterian Hospital, and Professor of Psychiatry at Columbia and Weill Cornell Medical Schools, said, "The Klerman and Freedman prizes recognize innovative thinking and remarkable talent across the field of neuropsychiatry. Recognition for scientists early in their career helps them go on to receive further funding and is a precursor to further accomplishments. We applaud these researchers for their brilliant work, and we thank our generous donors who understand that support of brain and behavior research will continue to produce better treatment, and ultimately, cures and prevention for mental illness." The Brain & Behavior Research Foundation awards research grants to develop improved treatments, cures, and methods of prevention for mental illness. These illnesses include addiction, ADHD, anxiety, autism, bipolar disorder, borderline personality disorder, depression, eating disorders, OCD, PTSD, schizophrenia, and suicide prevention. Since 1987, the Foundation has awarded more than $394 million to fund more than 4,700 leading scientists around the world, which has led to over $3.9 billion in additional funding. 100% of every dollar donated for research is invested in our research grants. Our operating expenses are covered by separate foundation grants. For more information, visit bbrfoundation.org.